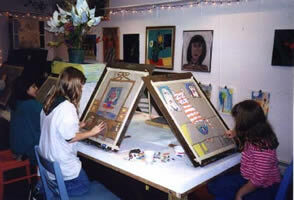 Creative Hands Art Studio offers Classes for Kids, Classes for Adults, and Workshops. We invite you to visit our Projects Gallery to see some of the beautiful work our 300+ students have created. Classes are held at our main location, the Atelier at 14 Kings Road in Madison. Air-conditioned in the summer and comfortably warm in the winter, the studios are colorfully inspiring, each with the feel of an authentic artist's workshop. We've designed them to be places where both kids and adults can relax, lose their inhibitions, and allow their creativity to soar. Classes are offered all year long, from on-going, 9-week Fall to Spring sessions (September to mid-June) to our flexible, week-by-week Summer session (late June to late August). If you have any questions, or would like us to mail you one of our brochures, e-mail us at admin@creativehandsartstudio.com or call our Office at (908) 604-0773. For directions, see the Contact Us page.